Time is as important as money in business. That’s why you need to know where time is spent and what activities are causing wastage of time. Whether you work for a company or run your own business, tracking time can help in increasing productivity and helps you to understand better which tasks or activities are consuming more time. That is why more and more companies are investing in a good time tracking software. You can use it for billing purposes or just to get a better idea of how your work day is split up. 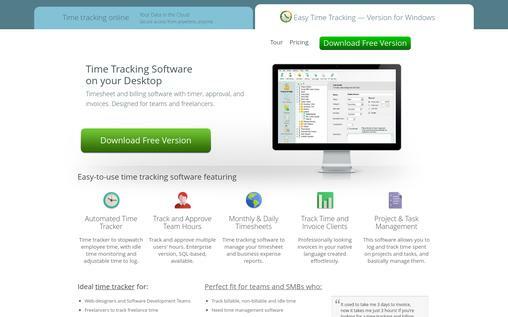 To help you find the best time tracking software for you, we have prepared a list of the 10 best time tracking software. Check them all, you will surely find a solution for yourself. Time Doctor is one of the most accurate time tracking and time management software that helps you to get a lot of things done each day. This is a web-based solution, providing time tracking, screenshot recording, computer work session monitoring, invoicing, reminders, integrations, reporting tools, and so much more. It not only tracks the exact time but also provides the breakdown of time spent. It integrates with your business tools such as Freshdesk, Zoho, Salesforce, Freshbooks and more. 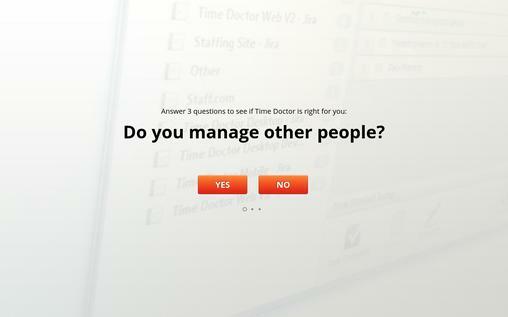 Time Doctor gently nudges you when you spend an excess amount of time on Facebook or other personal web browsing. It can take screenshots of the computer screen of each person in your company in every few minutes. Gives you detailed insights and reports to helps you to what’s occupying the most of your time. You can give access to your client to see the data about your work. You own software can interact directly with Time Doctor through API. You can setup Payroll to pay your employees through payment gateways such as PayPal, TransferWise, and Payoneer. You can take a free trial of 30 days. You use this for an affordable price of $9.99/user/month/. 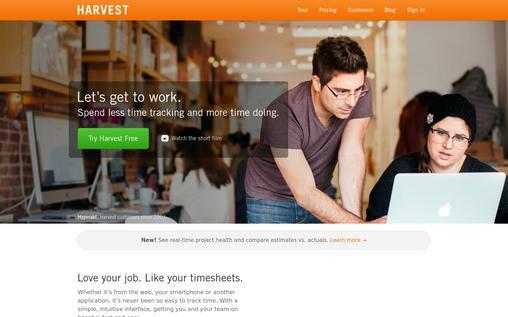 Harvest is a web-based time tracking software that provides an easy and powerful way to track your employees’ time and expenses as well as the progress of each project. Harvest features an intuitive interface where anyone can easily create projects, add clients and manage hours, and it can go anywhere you go with full functionality. It can monitor the time spent on a specific project. Ability to easily track expenses related to a task or project. The mobile app allows you to take a snap of your receipt and attach it to the expense report, and they are automatically pulled into invoices. You can get a notification if your project goes over a certain percentage of the budget. You can generate any number of reports such as project reports, expense reports, and task reports. The web invoice option allows you to send the link of the online invoice to your client and your client can pay the invoice online using the credit card or PayPal. You can export the reports to CSV, Google Docs, Excel or QuickBooks. Lets you assign various projects to your employees and add notes where needed. Also, you can specify the hourly rate for each employee. Your team can easily track their time on their laptop, Android, iPhone or even on the Apple Watch. It integrates seamlessly with more than 80 popular apps, from project management to accounting software. It offers a free trial of 30 days. The pricing plan starts at $12 per month for 1 user. TimeLive is an easy and flexible time and expense tracking tool which is available both, on cloud and self-hosted versions. It’s easy to set up, fully customizable and supports multiple-languages, also it offers a mobile app to capture your time against your projects, tasks and clients while on the go. It integrates with one of the most popular accounting software, QuickBooks for easy accounting. Customizable email notifications and reminders. You can track time for customized periods such as daily, weekly, bi-weekly, monthly and semi-monthly for your time sheet input. You can implement your own policies such as maximum and minimum hours to be worked per day, week start days and weekends and more. It offers free data migration services. Reports are available with all possible filters and you can create new reports and also customize the previous ones. You can its 30 days free trial to try it before buying. It offers you 24/7 technical support. 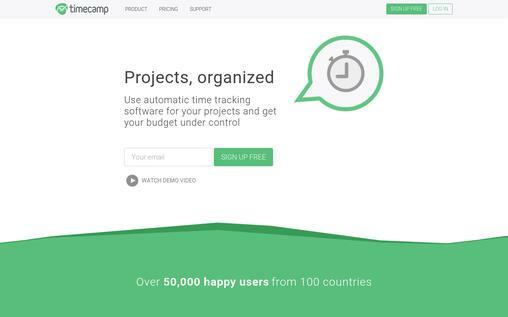 TimeCamp is a web-based time tracking software that offers both manual and automatic time tracking. It offers a variety of features such as calculating billable tasks, time management, creating invoices and tracking attendance. With over 50000 happy users across 100 countries, it provides the perfect tools for small, medium and large size businesses. The timesheet module provides a dashboard of work hours and also enables automated time tracking for employees. The project management can create different sub-tasks in any projects and assign each sub-task within the team. The time management feature allows automated tracking of computer usage and generates productivity analysis for each employee. It shares automated weekly emails summarizing task completed, productive hours, time wasted and lists of time-consuming websites. You can create bills according to working hours, complexity and employees assigned. Toggl offers the simplest way to track time in real time with one single click. 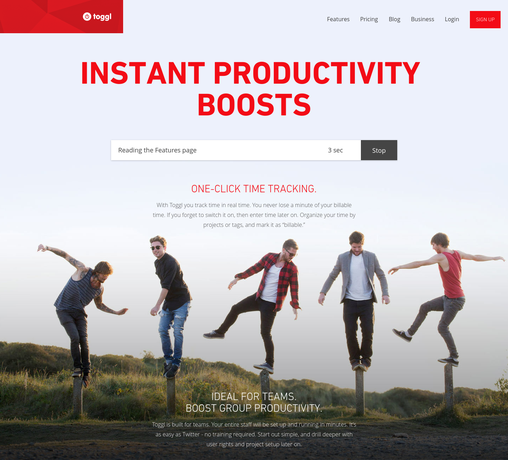 It is built for teams to boost their group productivity. You can setup Toggl in minutes for simple time tracking, and later you can set up user rights and project setup. Get an instant overview of your billable time and turn them to professional emails. It is designed to work with an unlimited number of clients with multiple tags, projects and more. It allows you to set billable rates. It can track your hours while you are offline which are synced back to your account once you are online. You can divide teams of different departments into user groups for easy tracking. You can share reports via a custom link or you can even export timesheets to PDV, CSV, and Excel files and share them via email. The pricing plan starts at $10 per user per month. 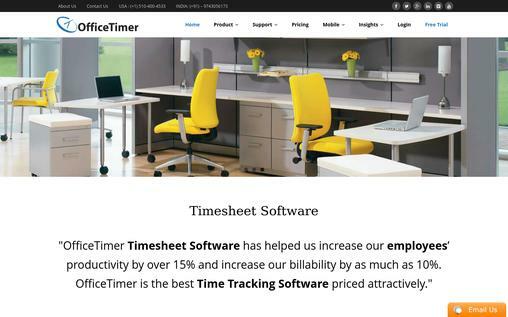 Easy Time Tracking is timesheet and billing software with approval, timer, and invoices. It is ideal for teams and SMBs including freelancers, web designers, software developers, and lawyers. It offers both cloud and windows version for time-tracking. It offers different time recording programs such as Week Logger, Quick Logger, and Automatic Timer. Week Logger offers the fastest way to manually log your own time. Quick Time Logger allows you to fill out timesheets without opening the program window. Automatic timer allows you automatically capture your daily time allocation. Timesheets are fully customizable and allow you to track both time and bill for it. It has an online time tracking add-on which you can securely access from anywhere, anytime and easily sync with the main application. The web-based component allows you to log in and update your time logs on the go and you can synchronize the information with the desktop component when you get back. It is available at $29 per month for up to 5 users and 50 projects. Hubstaff is a time tracking software designed to help businesses to effectively manage the productivity and workflow of their remote teams. 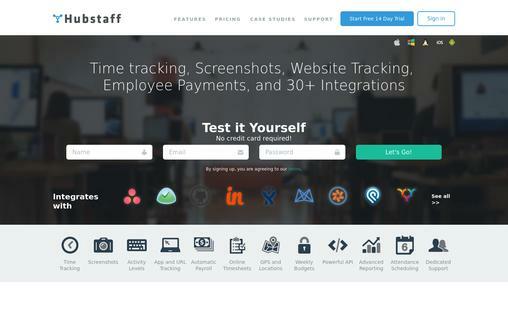 Some of the notable features are the automatic time tracking and monitoring with screenshots, automatic payroll, internet monitoring, application monitoring, and reports. It allows you to see what your team members are working on in real-time. With Hubstaff’s budget feature you can set the working time limits for each team member and the app will prevent them from exceeding the limits. Automatic Payroll allows you to pay your team automatically through Paypal, Bitwage and Payoneer. The time tracking apps for Android and iOs allows you to track time while on the go. It gives you insight into which applications your employees are using and the URLs they are browsing while tracking time. You assign the role of a viewer to your client to make them view the wok progress directly on your project. It is compatible with your operating system; whether it is Mac, Windows or Linux. The advanced API allows you to import the retrieved data from Hubstaff to your own project. It offers a full-featured free trial of 14 days. The price starts at $5 per month. OfficeTimer is a highly practical yet simple time tracking software to help freelancers, contractors, and SMBs to keep track of their billable hours and expenses. This cloud-based software updates the timesheet in real-time for instant tracking and has apps for Android and iOs devices to track your employee time when on the move. Track time through various types of employee Timesheet such as Weekly Timesheet, Monthly Timesheet, Daily Timesheet, Bi-Weekly Timesheet, and Semi-Monthly Timesheet. You can import or export the employee Timesheet. Customize the timesheet by adding your own custom fields. You can do time entry in decimal or in time format in the timesheet. You can integrate OfficeTimer to your biometric attendance system. It offers an extremely affordable pricing plan, starting at $3.50 per user per month. 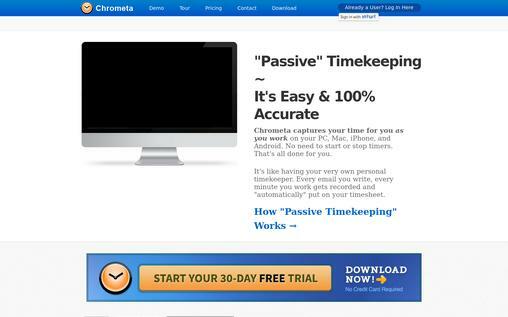 Chrometa is a time tracking software that automatically tracks what you are doing. With Chrometa, you don’t need to input or record your time throughout the day; it automatically captures every minute of your work and accurately put on your timesheet with no data entry or interaction required. Chrometa captures every minute you spend working on your Pc and/or Mac, including time spent reading and responding to emails, researching on the web, writing documents etc. The apps for iOs and Android turn your phone calls into billable time entries automatically and help you to capture your time on the go. 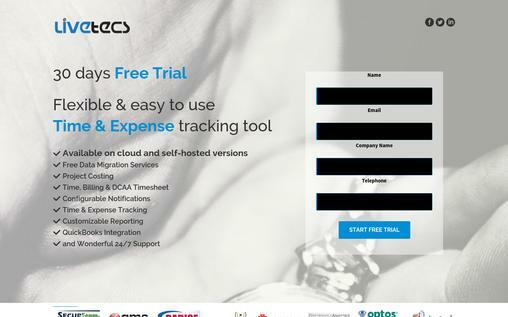 It automatically transfers your timesheet into Quickbooks, Clio and other accounting and practice management software to save your time and effort. It offers a 30-day free trial. The pricing plan starts at $12/month with free product upgrade and 7 days/ week support via chat, email, and phone. 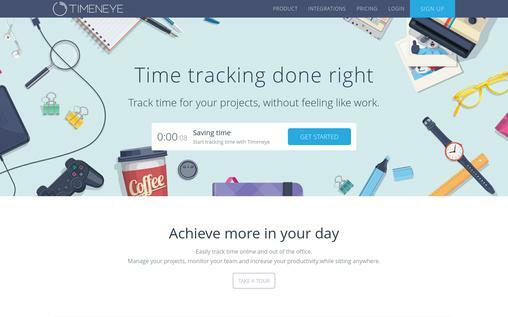 Timeneye is a simple, easy to use and intelligent time tracking tool which helps small or medium companies to track their team productivity level, but it is equally helpful for freelancers. Manage your time using an automated timer or manual entries. It integrates with the tools that you are already using such as Basecamp, Trello, Wunderlist, asana and more. The project management view lets you view the status of any project in real-time. You can see the time spent by your team members on different tasks. Generates accurate time reports that are fully customizable. It offers a free plan for single users, ideal for freelancers. The pricing plan starts at $24 per month for 5 users. It offers a free trial of 14 days. All the software that we looked above are highly praised by their users, so you can choose any one of them depending upon your budget and feature requirements. Most of the software has a free trial period, so you have an opportunity to try it and see how helpful it is for you and your business. Thanks Pankaj for sharing this great post. I would recommend Fanurio (http://www.fanuriotimetracking.com) as another awesome tool if you are looking for a simple time tracking and billing solution. It’s a useful application, with a user-friendly interface. Time tracking made easy with zelican. Get a free trial to explore more on this.